Sakhon Nakhon is the town of the sacred Phra That Choeng Chum and the vast Nong Han Lake. The Phu Thai tribe people living around the town offer an interesting study in ancient customs and traditions, such as the "Wax Castle" festival in October when castles fashioned from wax are celebrated. Sakon Nakhon is 647 kilometers from Bangkok. Perched on the highlands of the Northeastern Plateau, inland from the Mekhong River bordering the Thai-Laotian frontier, is the Province of Sakhon Nakhon, at an average height of 172 meters above mean sea level, with a rich heritage in history, anchaeology and folklore. 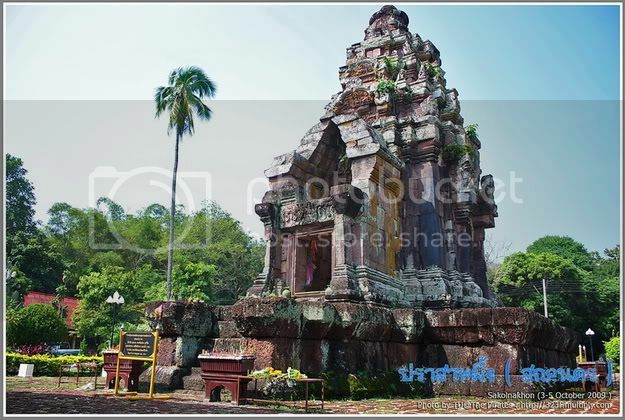 Sakhon Nakhon exist ed as a major city in the Khmer Empire of Khotraboon, with the ancient city of Srikhotraboon within present-day Udon Thani Province as the capital, at the height of its glory during the 12th to the 16th centuries. Many Khmer shrines and artefacts stand proof to the claim and constitute major attractions of the province. The Shrine of the Holy Relic of Narai Jengweng, Phuphek, Dum and the Khmer Bridge are a few examples. The Phuphan Mountain Range to the south of the province serves as a natural borderline of Sakhon Nakhon and makes up the main feature of the province. A large reservoir next to and brought about by the mountain range, Nong Han, the third largest inland lake in the country, is full the whole year round, being the repository of many major rivers in the area. This natural reservoir served as the site of the ancient city, from whence the name Nong Han Luang originated. It is a huge water source of 12 / 20 kilometers, with an average depth of 3 to 6 meters. The city of Nong Han Luang was said to have been built by a Khmer prince, the then viceroy of Inthapat, who came to establish the new city on the bank of the large reservoir with his family and followers. The original Khmer city is presently at the district of Tha Sala. It was deserted some time after its founding when a severe drought prompted the Khmer prince to move the new settlement back to Khotraboon. Later, a monarch of the Thai Kingdom, either at Sukhothai or Ayutthaya, extended his power and influence by appointing the Deputy Governor of Kalasin to rule the city as part of the Thai Kingdom. The city was renamed "Sakon Thavapi" or the New City by the Pond. In The early Bangkok period, when Prince Anuwong of Vientiene rebelled against Bangkok and forced Thai families in Korat towards Vientiene, an incident brought Lady Mo to fame as the heroine of the northeast. Sakhon Nakhon failed to comply with the order from Bangkok to get fresh supplies of gumpowder and reinforcements for the army sent to suppress the rebellion. The ruler of Sakhon Nakhon was executed, the people were evicted to Krabin and Chanthakham. A member of the ruling family of Kalasin was posted to Sakhon Thavapi with a number of his subordinates, to look after the Holy Relic of Choengchum. Later in the reign, King Rama III appointed a descendent of the ruler of Nakhon Phanom who sought protection in Bangkok during the Anuwong incident, to rule the city under the title of Phraya Prachanthathani. The city was renamed Sakhon Nakhon. Before the consolidation of the power and influence of Bangkok in the early Bangkok period, the city was more or less under the influence of the Kingdom of Lanchang on the left bank of the Mekhong River. Mass migration of the ethnic Phuthai and So tribes took place on many occasions. The former concentrated in the district of Phannanikhom, while the latter settled down mostly in the District of Kusuman. Both tribes maintain their distinctive lifestyles and rich folk traditions. The most significant religious site is the Shrine of the Holy Relic of Choengchum, within the city area. The stupa, in seek from resmbling a young banana flower-bud, is said to have been built around the 10th century, over one of the most peculiar and sacred sites in Buddhism, where footprints of the Lord Buddha and three other Buddhas before him were made at exactly the same place. The shrine has been regarded bu Buddhist in Thailand and Laos. The temple hall next to the stupa houses a revered Buddha image called Phra-ong Saen, in Khmer style, with a stern face. A new image was built with a smiling face, and enshrined together with the original one. Two masters of meditation who put Sakhon Nakhon firmly on the map of Buddhist pilgrimages were the reverend Man Bhuridatto and the reverand Fan Acharo who truthfully started the movement for Buddhists to seek theii inner selves and an ultimate state of mind that cannot be troubled by worldly happenings. A museum of the reverend Mn Bhuridatto is situated in his temple of residence, Wat Pa Sutthavat Within the town district, while a memorial of the reverend Fan Acharo as a stupa and a museum was built over his crematory pyre at Wat Pa Udom Somphorn in Phannanikhom District. The Phuphan Mountain Range features ancient rock layers formed millenia ago. Peculiar hideouts and dense forest made it ideal as an insurgents' stronghold. It was here that the Communist armed struggle started two decades ago. After peace and order was fully restored, a royal palace was built atop Phuphan. The palace has served as the headquarters of Their Majesties the King and the Queen for their yearly visits to the people of the Northeast, normally in November. A major center of the SUPPORT Foundation under the royal patronage of Her Majesty the Queen is situated within the Phuphan Palace and has been instrumental in the revival of ancient and ethnic textiles of this rich region. The mountain slopes are rich in flora and fauna. The hills erupt in glorious colors year by year with wild flowers that are unique to the area. There are ten existing national reserve forests, and six more to be declared reserved areas. The inhabitants of Sakhon Nakhon are no less colorful and varied. They strictly observe their ethnic culture and tradition. A festival in Sakhon Nakhon, be it the Wax Castles Festival, the Rocket Festival or the Long Boat Procession, brings out the great variety of ethnic Thai tribes at their best. The Phra That Choeng Chum a major and sacred religious monument of Sakon Nakhon, is enshrined at Wat Phra That Choeng Chum in town. Of rectangular shape, it is made of mortar and bricks with a height of 24 meters. Another religious structure is the Phra That Narai Clheng Weng. It is located at the Ban That village about five kilometers from town center. It is of Khom-style pagoda, made of laterite, and 12 meters high. The 32-sq.km. Nong Han Lake in Sakon Nakhon is a popular place of relaxation. Its offshore isles, particularly the Don Sawan, are both beautiful and restful and can be easily reached by hired boats. Wax Castle Procession was the northeastern Sakon Nakhon province's "Wax Castle Procession", the procession carried a castle made of wax and banana husks. 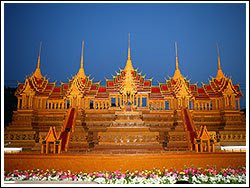 This wax castle is usually presented to the province's Phra Maha That relic as a tribute to the Lord Buddha at the end of the Buddhist Lent Day.